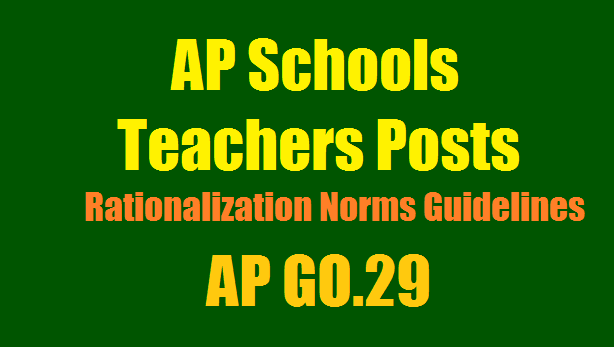 AP Schools, Teacher Posts,Staff Rationalization Norms/Guidelines: AP School Posts, Staff, Teachers rationalization norms and guidelines, AP GO.No.29 AP Teachers, AP Schools staff rationalization norms, AP Primary, UP, High schools rationalization guidelines and norms, AP Schools and Teachers rationalization guidelines, One class-One teacher. AP GO.29 AP Schools, Posts, Staff(Teachers) Rationalization Norms/Guidelines: Norms for Rationalisation of Schools, Posts and Staff under various managements (viz.) Government, Zilla Parishad, Mandal Parishad Schools in AP.GO 29 AP Rationalisation Norms 2017 AP Schools Rationalization Guidelines. Schools Ratoinalisation Guidelines and Norms for 2017 released by School Education Department of Andhra Pradesh. School Education - Norms for Rationalisation of Schools, Posts and Staff under various managements (viz.) Government, Zilla Parishad, Mandal Parishad Schools – Orders - Issued. G.O.MS.No. 29 Dated: 22-05-2017. Basing on this rationalisation Guidelines released by Govt vide GO 29 All the Schools in the AP State will follow the Staff Pattern from 2017. Details of the Rationalisation GO 29 are given below. Rationalization of Posts should be based on UDISE Data. (i) Minimum staff to be provided for Upper Primary Schools with 31-100 enrollment in classes VI to VII shall be 4 subject teachers. (ii) Minimum staff to be provided for Upper Primary Schools with 41-140 enrollment in Classes VI to VIII shall be 6 subject teachers.